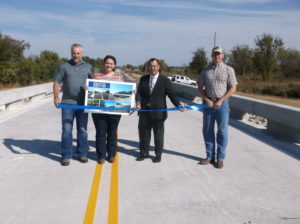 A ribbon cutting was held for the newly constructed Bridge #12 over Unnamed Creek on October 11 at 10:30 am, according to Commissioner Mitch Antle, Washington County District 1. The project was designed by Guy Engineering Services, Tulsa, OK. The original bridge consisted of three five-foot diameter metal pipes. The contractor, RRY Services of Stillwater, OK, replaced the bridge with a 26 foot wide, 80 feet long prestressed concrete beam bridge. The project also included 1,200 feet of asphalt pavement reconstruction, as well as widening, pavement striping, and new ditches. The new bridge will improve safety and accessibility for drivers in Washington County. Funding was provided by a combination of Surface Transportation Program (STP) Funds, Oklahoma’s County Improvements for Roads and Bridges (CIRB) Program, and local funds.